in 1970, Brian Biedebach purchased this bike new in California. He rode it nearly every day until 2001 when he was diagnosed with cancer. As he lost his strength to the disease, Brian reserved his rides to Sundays. Unfortunately, Brian lost his battle and passed away in 2004. The bike was given to Brian's brother David with the request for David to ride the bike every Sunday to keep it in good running condition. While David has fond memories of the bike, such as riding on the back of it to the candy store when he was nine years old, as someone who is not an avid motorcyclist he managed to ride the bike only a few times. 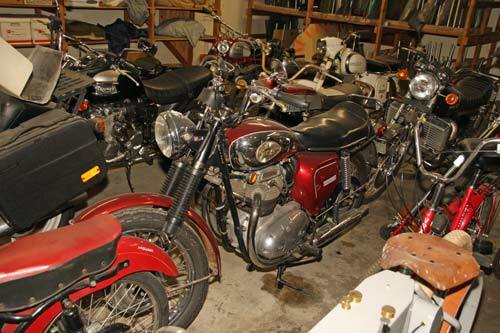 In order to honor his brother's wishes, David decided the bike would be better cared-for by a museum. As you can see, the bike is still in excellent condition after 40+ years and more than 70,000 miles. This exemplifies the tremendous passion Brian had for the bike, including the original custom California license plate that reads MY70BSA.